This item is expected to ship 4-6 weeks after the event on April 2, 2019. The panic set in very fast for this actual nurse. What went wrong with this all-too-real scenario? What is the facility’s responsibility? What should Sue do? Is Sue the only team member who should be pursued? 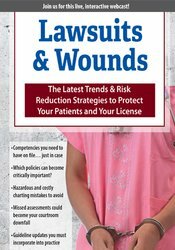 You will be able to answer these questions, practice more confidently and formulate strategies to protect yourself after spending one enlightening day with Ann Taylor MS, RN, CWOCN®, National Wound Expert and Legal Consultant. Analyze 5 common wound care failures. Summarize costly – and common – documentation mistakes. Select interventions to manage wounds with current care guidelines in place. Formulate appropriate plans of care for different wound presentations. Incorporate algorithms to improve your care. Differentiate care considerations for specific populations at risk for pressure injuries. Where do you find standards of care? Don’t fail to follow your own policies! Ann Kahl Taylor created Kahl WOC Consults in 2002 to provide wound care and legal consults across the care settings. With over 20 years of experience as a specialty nurse in wound, ostomy and continence nursing, she has a vast amount of knowledge about how to reduce the risk of legal exposure through incorporation of current wound management trends and protocols. Her practice in the legal arena is busy and has grown significantly. Ann's commitment to clinical excellence and patient outcomes is evident by her committee work with the Wound, Ostomy and Continence Nurses Society (WOCN™). She has also served on the Wound, Ostomy and Continence Nurses Certification Board, most recently on the Job Analysis Task Force. As an author, Ann has over 20 clinical wound abstracts and has created numerous policies, algorithms and guidelines for use in practice. Financial: Ann Kahl Taylor is the owner of Kahl WOC Consults. She has an employment relationship with Spalding Regional Medical Center. Ms. Kahl Taylor receives a speaking honorarium from PESI, Inc.
Nonfinancial: Ann Kahl Taylor is a member of the national Wound, Ostomy, and Continence Nurses Society (WOCN). She is a member of the WOCN Certification Board, Marketing Committee. Nurses completing these self-study materials will earn 6.3 contact hours. Expires: 4/2/2022.